Jason Kottke today linked to some scanned pages of Sassy from the early 1990s. Jason observes, "Sassy seems to be one of those rare magazines that is dearly missed but doesn't really have a modern day analogue. (See also Might and Spy.)" True enough. What occurred to me, however, was that those three magazines have something in common: a very strong editorial hand. In all three cases the editors are pretty well-known people: Jane Pratt in the case of Sassy, Dave Eggers for Might, and Kurt Andersen/E. Graydon Carter for Spy. So the reason they either don't exist or have not been replaced is that those specific people have elected to do other things. As announced in the New York Times, Alfred A. Knopf will be publishing David Remnick’s biography of Barack Obama on April 6, 2010. The book, entitled The Bridge: The Life and Rise of Barack Obama, has been in the works for a while, as Emily reported here at Emdashes in 2008. We’re running this nifty photo collage, which our designer friend Jennifer Hadley (creator of the original Emdashes logo) created last year for a significant milestone, to wish The New Yorker’s editor many happy returns of the day. The image is made up of magazine covers and other images (including a Russian postcard) from Remnick’s birth year, part of the environment of word and image that formed an editor perfectly suited to both a righteous tradition and a challenging new age. Who could have predicted how the picture of print media would change? Thankfully, we still have great magazines to celebrate, and as always but especially today, the one whose host we toast is The New Yorker. to tell you that we think “The Editors of The New Yorker,” Pollux’s drawing of Harold Ross, William Shawn, Robert Gottlieb, Tina Brown, and David Remnick, is so suitable for framing that it’s already framed, and available from those clever ducks at CafePress. Buy one for your favorite New Yorker lover and hang one in your office to remind yourself that you won’t let your standards slip, economy be damned. These five wouldn’t stand for it, and, with them keeping watch, neither will you! —E.G. 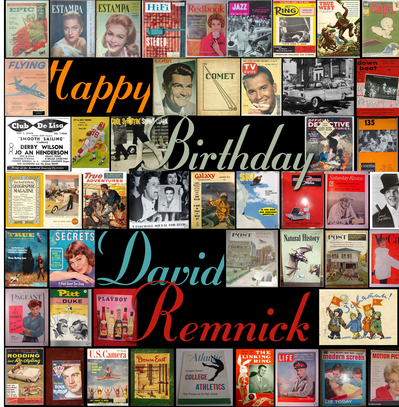 Happy 10th Anniversary, David Remnick! Remnick has much to celebrate after 10 years: circulation of The New Yorker has risen by 32 per cent, to more than 1m copies a week; re-subscription rates, at 85 per cent, are the highest in the industry; and despite the conventional wisdom that young readers don’t have the attention span to do more than blog, text and twitter, the magazine has seen its 18-to-24 readership grow by 24 per cent and its 25-to-34 readership rise 52 per cent. Twenty-four of its 47 National Magazine Awards were awarded under Remnick’s tenure. Perhaps most reassuring of all, The New Yorker’s balance sheet has moved from red to black - although its private ownership precludes him from revealing how much profit it makes. Remnick's Jazz List: Let the Omission-Counterlisting Begin!